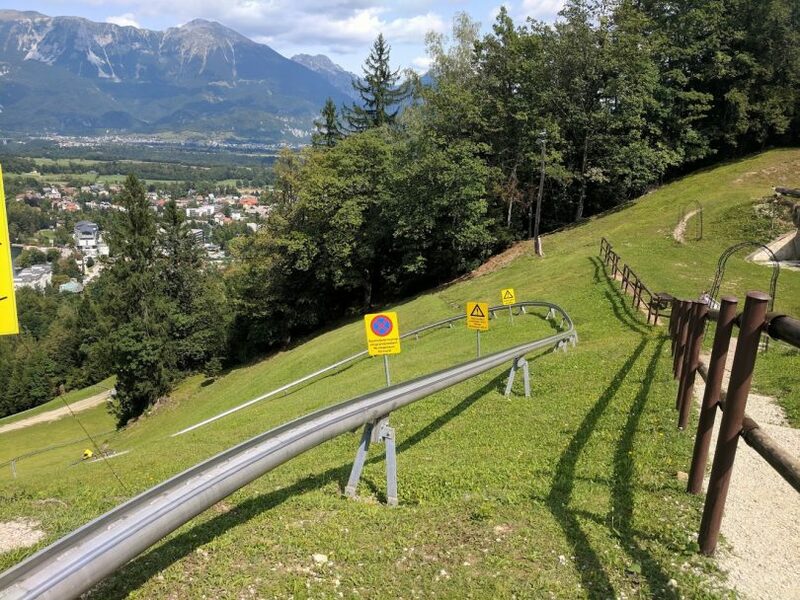 Looking for a bit of a thrill on your trip to Lake Bled? 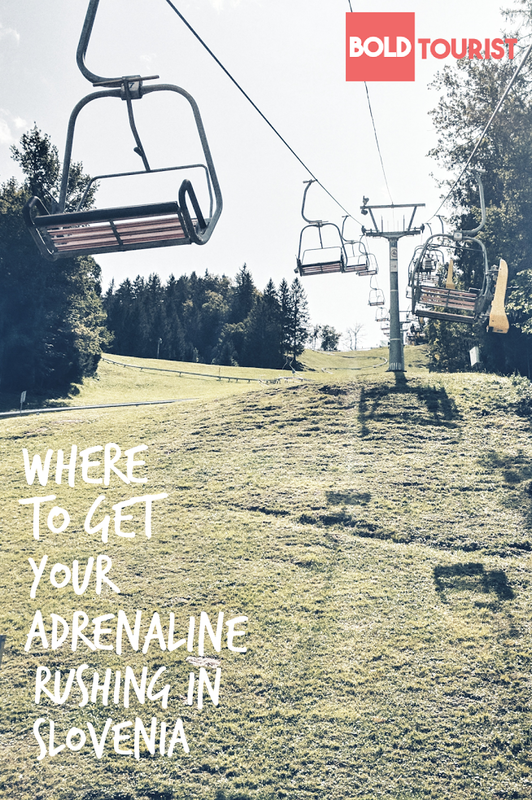 The Straža Mountain Resort in Bled, Slovenia has some seriously intense stuff waiting for you. 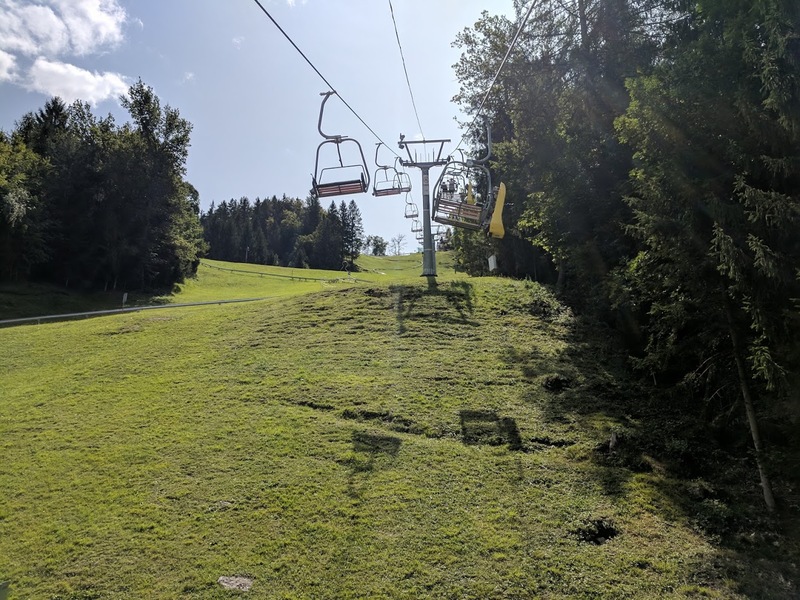 During the winter, they offer a ski resort that has your normal ski runs, chairlifts, and ski programs for kids- all with glorious views. 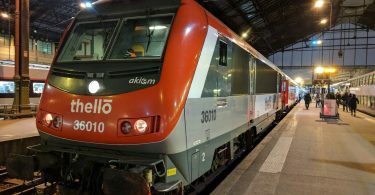 However, in the summer, these smart folks decided to keep their operation running with an adventure park that is fit for kids and adults alike. The big attraction at Straža Resort is the tobogganing. 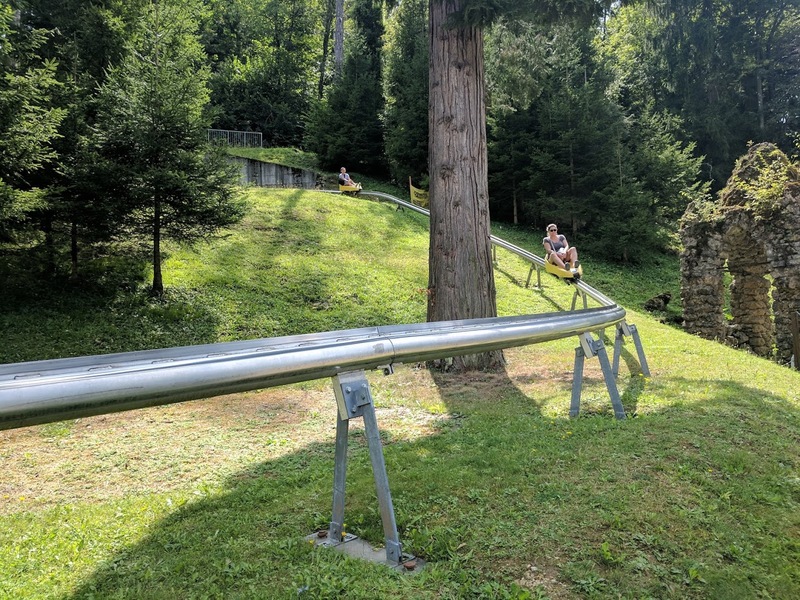 Which, in our minds, we called the “Mountain Coaster.” This thing is basically a metal track that snakes all the way down a ski run, which they attach little carts to and send tourists flying down. See that little metal thing snaking up the hill? That’s the toboggan run! When we were planning to visit, I wasn’t sure what to expect. I had many doubts about the safety, but I watched for quite a while and saw people of all ages, at different speeds, arrive safely at the bottom of the hill. After neglecting to see anyone fall off and/or die, I felt ready for the challenge. 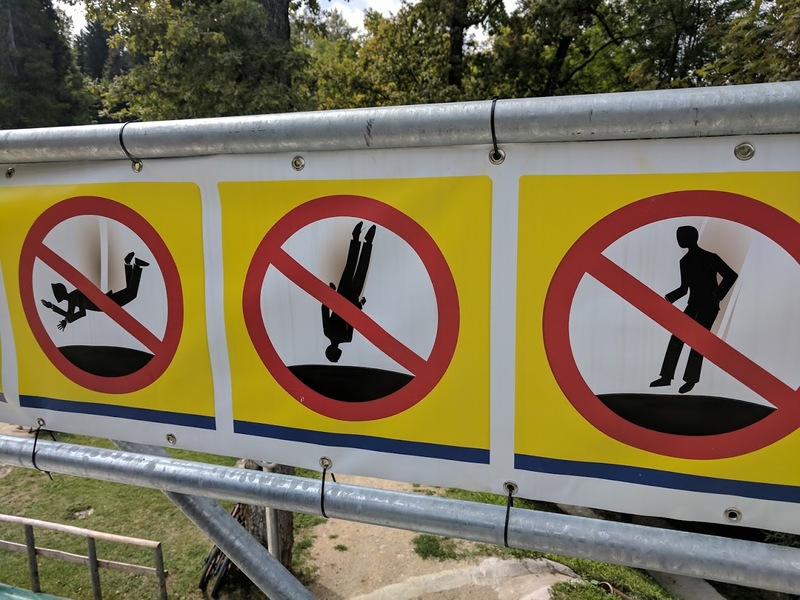 Warning signs for a jump made me worried— how do you jump, if you don’t do one of these? The answer is: you land on your bum. 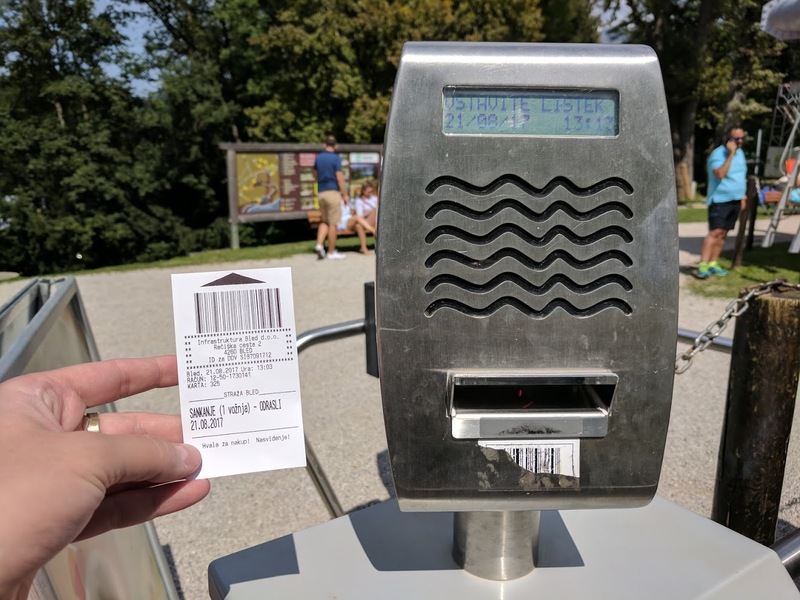 To get to the top of the hill, you buy a pass at the ticket office and scan it into the card reader at the chairlift. Then you ride the chairlift above the coaster, which means you both get nice views and start to feel the anticipation for what is about to happen. At the top, you queue for another line to get on the ride. 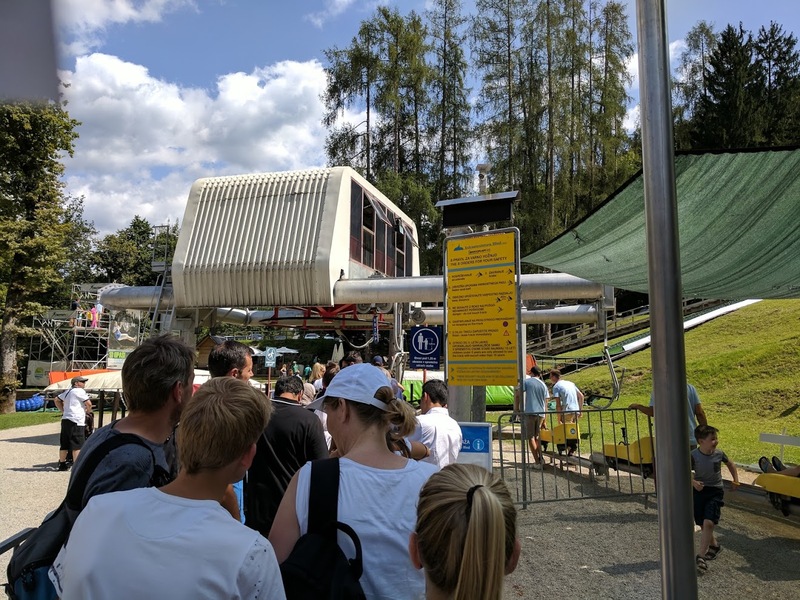 The queue for the chairlift at the height of summer season- only about 5 minutes total! 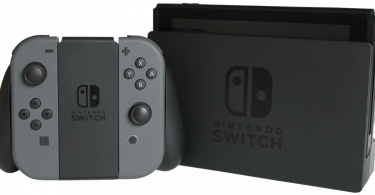 Buy the ticket at the ticket office and slip it into this machine. The toboggans, as they call them, are just little carts attached to the track. You have a seatbelt and a brake/accelerate stick that fits between your legs, and you’re off! It was steeper than I imagined and has lots of twists and turns- not for the faint at heart! After getting off the chairlift, you get in another line, which is fairly short, to start the toboggan ride back down. Views are incredible! If parents are riding with young children they allow one adult and one kid to strap into the track together. Otherwise, you’re on your own as you fly down the side of a mountain. I was all smiles, as were all five people in our group, when the coaster finished. It was really fun and something I’d absolutely recommend! 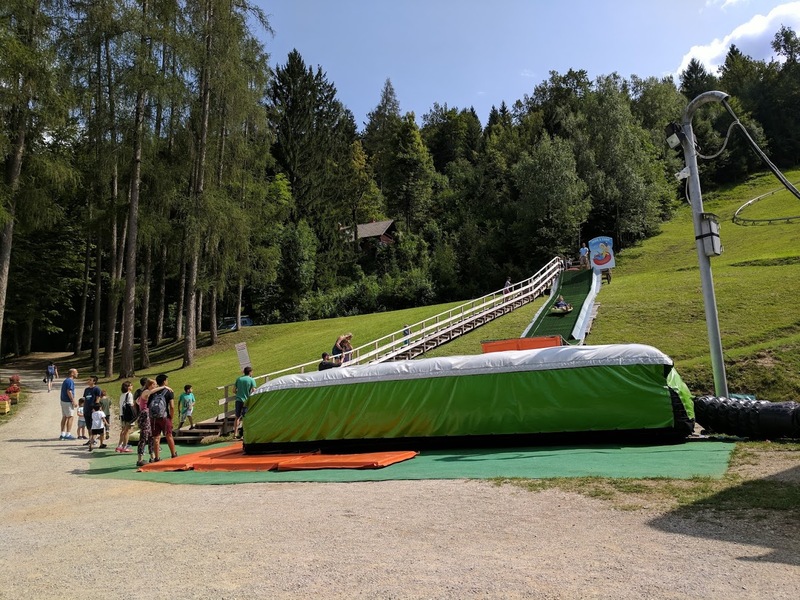 There’s other really fun “adventure” experiences at the park- jumping off a ledge onto a giant pillow, tubing, a zip line, and a ropes course. 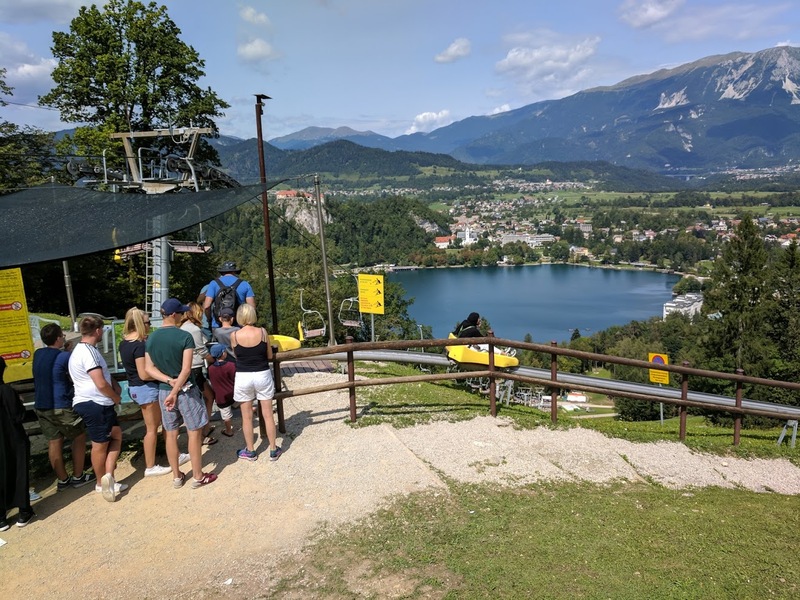 It’s a great way to spend a day- or half a day, even- while you’re visiting Lake Bled! This little tubing hill was “for kids” but was really fun for the adults too!